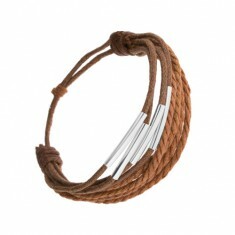 Your favorite product: Shiny knitted bracelet two colors, angular steel necklace SP50.19 - is added to the wish list. Adjustable bracelet - dark brown and beige smooth yarn zaplétaná around a chain of steel 304L. 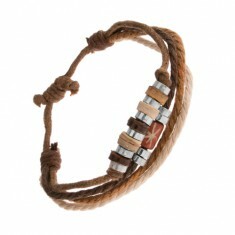 Your favorite product: Bracelet made of strings, brown and beige colors, wooden and steel beads U23.19 - is added to the wish list. Brownish-beige šňůrkový bracelet, steel and wooden rings, the greater the bead - roller with a carved star. Your favorite product: Šňůrkový bracelet chocolate brown color, the balls and the crosses from the steel U26.11 - is added to the wish list. 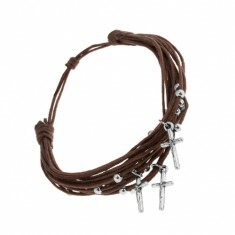 Adjustable bracelet made of dark brown motouzků, steel balls, three pendants - shiny antiqued cross. Your favorite product: Bracelet made of strings of cinnamon and dark brown in color, narrow rollers of steel Q2.20 - is added to the wish list. Šňůrkový bracelet , adjustable length, dark brown and cinnamon color, movable steel tubes. 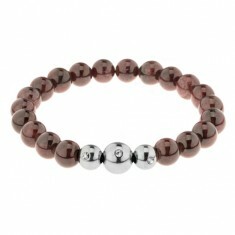 Your favorite product: An elasticated bracelet of shiny garnet beads, brown color, steel beads Z35.15 - is added to the wish list. 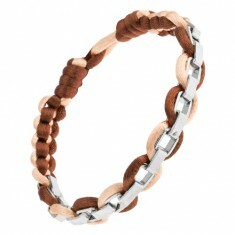 Bracelet in the form of shiny round stones and three beads of steel, with cubic zirconia, elastic rubber band. 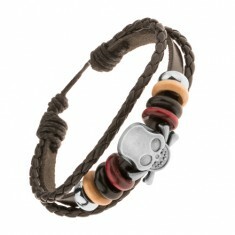 Your favorite product: Bracelet made of brown faux leather, steel skull with swords crossed Y30.01 - is added to the wish list. 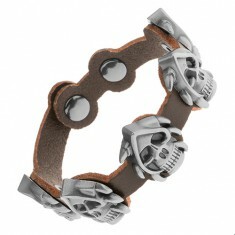 Dark brown leather bracelet on his hand, five linked circles with patinovanými skulls of steel, rivets, adjustable length. Your favorite product: Leather bracelet dark brown in color, frosted patinated skull of steel, claws Y30.06 - is added to the wish list. 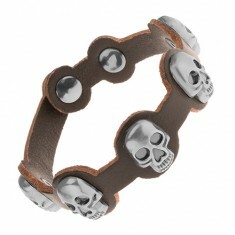 Dark brown bracelet made of artificial leather, five rings, steel skull with matte patinovaným surface, rivets, adjustable length. Your favorite product: Leather bracelet dark brown color, patinated leaves of marijuana from a steel Y33.05 - is added to the wish list. Also dark brown bracelet made of artificial leather, five circles, steel marijuana leaves with patinovaným surface, rivets. Your favorite product: Leather bracelet dark brown in color, frosted patinated skull of steel Y34.13 - is added to the wish list. Also dark brown bracelet made of artificial leather, five rings, steel skull with matte patinovaným surface, rivets, adjustable length. 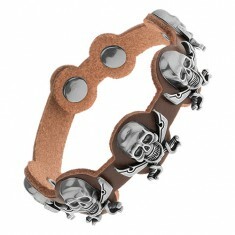 Your favorite product: Leather bracelet brown color, frosted patinated skull of steel Y40.20 - is added to the wish list. 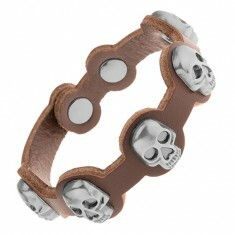 Brown bracelet made of artificial leather, five rings, steel skull with matte patinovaným surface, rivets, adjustable length. Your favorite product: Adjustable bracelet made of brown faux leather and steel studded spikes Y39.04 - is added to the wish list. 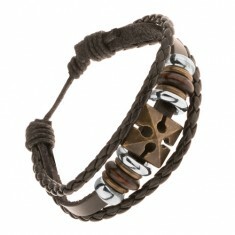 Brown bracelet made of synthetic leather, lea's steel ovals and pointed cones, fastening the buckle. 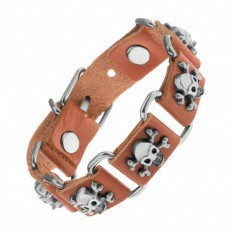 Your favorite product: Brown bracelet made of synthetic leather and steel, the skull with překříženými bones Y43.09 - is added to the wish list. Bracelet with adjustable length from brown faux leather and steel ovals antiqued bulging of the skull, button fastening on the buckle. Your favorite product: Brown bracelet made of artificial leather and steel ovals, symbols of the Fleur de Lis Y43.11 - is added to the wish list. Adjustable bracelet made of brown synthetic leather and steel, patinated symbols of the royal lilies. Your favorite product: Adjustable bracelet from strips of faux leather, beads, steel skull with bones Y44.08 - is added to the wish list. Multináramek of tmavohnědých leather belts and strings, colorful beads made of steel and wood, old skull with překříženými bones. Your favorite product: Brown adjustable bracelet made of artificial leather, cross, beads made of wood and steel Y45.14 - is added to the wish list. Multináramek of tmavohnědých leather belts and cords, colored steel and wooden beads, patinated cross brass color.